Every day, Sun God enjoys rich cacao beans, grown from the cacao trees on the banks of the Great Pond. Wind God encourages him to share with the people of the earth, but Sun God refuses. So Wind God transforms into a rana azul, a blue frog, and spies on the Sun God. When Wind God discovers where the greedy God hides his stash of chocolate delights, he tells los niños from the village. The Aztec people search for the treasure and soon discover the secret food of the Gods, the cacao bean. 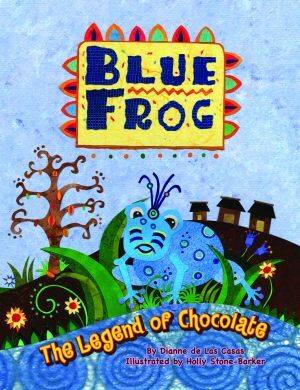 This vividly illustrated book, inspired by Mayan and Aztec art, comes complete with a recipe for hot cocoa. ¡Delicioso! Dianne de Las Casas is an award-winning author, storyteller, and recording artist. Her work has earned rave reviews from School Library Journal, Booklist, and Kirkus. She performs worldwide at schools, libraries, conferences, and special events. A self-confessed chocoholic, she is glad that Rana Azul told Earth’s people about cacao because she absolutely loves this delightful food of the gods. 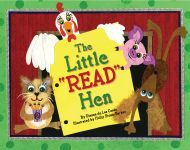 The author of Pelican’s The Cajun Cornbread Boy, Madame Poulet and Monsieur Roach, Mama’s Bayou, The Gigantic Sweet Potato, There’s a Dragon in the Library, and The House That Witchy Built, de Las Casas lives with her family in the New Orleans area. Illustrator Holly Stone-Barker graduated with a BFA in communication design from Pratt Institute in New York. She works as a freelance illustrator and enjoys teaching. Stone-Barker’s colorful illustrations are created with a variety of different papers that she finds in her travels. This is her third collaboration with Dianne de Las Casas. She lives in Baton Rouge, Louisiana, with her husband and two children. A peak into other cultures and history! BEWARE, BEWARE OF THE BIG BAD BEAR!